The last two miles looks mostly like this, including the ice and snow, often in September! When I first considered thru-hiking the John Muir Trail, by myself, I had tons of questions about permits and gear. It took lots of internet surfing, discussions with Rangers, emails to other hikers, and talks with sales people to get those answers. The larger question, for which I never did get a good answer, was this: what’s it like out there, hiking that far and that long by yourself? I’ve written about the first day. I’ve written about being terrorized in my tent by a squirrel. I’ve written about what I miss most when I’m not on the trail. And, I’ve written about getting up early to hike. In today’s post I’d like to describe the last day: what it is like to make it to the summit of Mount Whitney and then down to Whitney Portal. Most people spend their last night on the John Muir Trail at Guitar Lake. The reason for this is simple: this is the last place, close to the trail, to top off your water. There is a shallow water feature a couple thousand feet farther east, and just south, of the trail, but it is not a dependable source, especially in the latter part of the summer. If you are intending to top off your water before you begin hiking in the morning, Guitar Lake is your best choice. Your last night sleeping on the ground will likely be a little different than your previous ones. Guitar Lake is at 11,460 feet—higher than you may have camped previously, which means it will probably be a bit colder. There is not a single tree to be found to protect you from the wind, although boulders provide some shelter in the more choice spots. It’s also often crowded; almost everyone who thru-hikes the JMT will spend a night here. That is not really a problem, though, since everyone is in pretty great spirits, anticipating the next day. I’m a big believer in getting an early start on your last day. You’ve got 3,000 feet of climbing ahead of you, all in the thin air above 11,000 feet, as well as a sneaky long and difficult descent to the portal. How early you want to leave depends on your pace and how much of the trail you want to hike during daylight. It’s a little less than three miles to the trail junction, where you may drop your pack for the final, two-mile ascent. The views from the final two miles of the trail are quite good, so you may want to time your departure so that sunrise occurs not long after reaching the junction. Others prefer to hike the nearly five miles in the dark and watch sunrise from the summit (weather permitting). Reaching the summit is something you’ll never forget, particularly if you are arriving for the first time. Once you’ve taken a few minutes to enjoy the view, and the feeling of accomplishment, your mind will inevitably return to your first steps, often weeks earlier, at Happy Isles. Think of all the peaks you’ve walked past—and viewed in awe: Half Dome, Mount Ritter, Banner Peak, Vidette Peak, and others. Then contemplate that the tops of each are all well below the soles of your boots. You will run into day hikers, and will also see some of the same people who have been your on-again-off-again companions over the last couple of weeks. Both are good company. Once you’ve taken your photos, signed the register, and reflected on your success, it’s (almost) all downhill from here. One last piece of advice: don’t underestimate the final thirteen miles. The least of the challenges will be the short, uphill, stretch between trail junction and Trail Crest (although, I have to admit, each time I hike that short ascent it seems to be longer than I remembered). 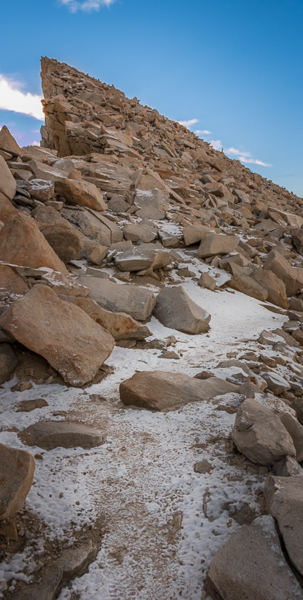 UPDATE: In June of 2014 a hiker died while descending from Mount Whitney after a day hike. Although the complete story is not known to me, now, it appears that he left the trail after the switchbacks and fell into a chute. There are places in the middle third of the descent where the trail is NOT well marked. If you intend to go from Guitar Lake to Whitney Portal on the same day, an early start is essential. Hiking that middle third of the descent is not a good idea at night. Once you begin the descent (from Trail Crest) the remaining miles can be divided roughly into three parts: the switchbacks, the ankle-breaking-and-knee-torturing middle, and the gentle final third. The switchbacks are repetitive, but not too much of an issue. (The biggest annoyance will be giving up the right away to the ascending day-hikers.) The last third is pure hiking pleasure: an easy downgrade on a soft, well-maintained trail. It’s also the last four miles of the entire trip! How can that NOT be heaven. It’s the middle third that’s excruciating. That portion has hundreds of “steps”, some of them quite high. Given what you’ve been through over the past few weeks, it’s almost impossible not to hurry, but try to resist the temptation. You want your first night out of the wilderness to be all about fine dining and clean sheets, not a fresh plaster cast and pain pills. Once you emerge from Whitney Portal your adventure will truly be complete. Well done! I really enjoy your blog, Ray! Thanks for the imagery and adventure. I’d add two other items – 1) being sad that your wonderful trip has to end. You had such a wonderful adventure up until now, but next, going back to your normal life, pales in comparison. I found myself wishing that I was not out of food so I could just keep on going on a trail. And 2) anticipation of a real (big) meal at the Portal. That alone kept me going through the second and third sections above. I agree – don’t underestimate the trip down to the Portal! You are absolutely right, especially for the first time thru-hiker there is an almost palpable sadness when you realize that the adventure is behind you. In regards to that big meal, I am a big fan of “Seasons” in Lone Pine. They have a version of a caprese salad that is amazing! Thanks for the kind words, Debra, and the comment! It’s hard to imagine people leaving WAG bags on the trail. Don’t you wish you could ask them some questions, like, “Who do you expect to pick this up?” or “How would you like it if people left bags of **** on your front porch?” As far as water quality is concerned, I tend to fill up at Guitar Lake for the entire trip, even if that means hauling water to the top. Thanks for the comment, Loren! Thanks so much for the kind words about the book, Kevin. You must have read it in one sitting! My hat is a Broner [http://www.broner.com/retail.html]. Good hiking! Ray… thx! Yes read e-book in one sitting. Great info and will continue to be a resource I will go back to. I will tell my hiking buddies about it. $7.00 what a deal. 99 days and we start! Your writing has inspired me. When I started to hear about the JMT I wanted to do it. Now that I learn more of what it takes to do this between the permits, weather, my body it has cast some doubts on myself. After reading your blogs I want to do it again. It’s not easy, Mike, but if you go at your own pace and, most importantly, plan and train properly, almost anyone can do it! Thanks for the comment. Ray, thanks for all of the thought-provoking articles. I find myself very contemplative on my last day. It’s very bittersweet wanting to finish and get off the trail, but knowing you’ll miss it VERY quickly after you’re off and home for awhile! Just a note: I think it’s 11 miles down from the summit of Whitney. I have 6 weeks until I take off for my annual JMT trek, I can’t wait!! Thanks for the kind words, Robert. In regards to the distance down, I believe you are right. Not sure where I got 13? Ray, I guess you probably came up with the number 13 because Whitney Portal is 13 miles west of Lone Pine. It’s a bit of haul regardless!